‘Gladiatrix’: or hands up, who threw that banana skin into the arena? – someone could have slipped on that and been hurt. 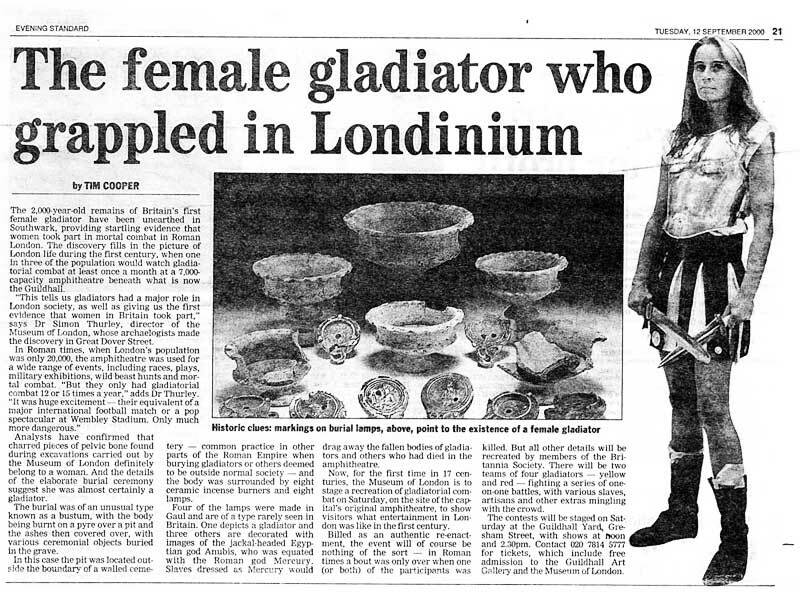 Whilst having a tidy up over the weekend, I came across this press cutting from the Evening Standard dated 12 September 2000: ‘The female gladiator who grappled in Londinium’. For those of you who don’t know what a ‘Gladiatrix’ looked like, the ES usefully included a rare (and extremely early) photograph of one. The story, like that which detailed Mr Saxby’s incredible ‘Tudor Banana’ a year earlier, was pretty rapidly disowned, but not before the Discovery Channel had knocked out a documentary ‘Gladiatrix’ which aired in May 2001. I had forgotten that for all of its sins, and believe me there are many, that there are some nice aerial views of the amphitheatre, and a goodly number of familiar archaeological suspects who appear as extras throughout (most with hindsight probably now regretting they had speaking parts, and I daresay soon to be cursing me for raising the alleged Gladiatrix once more from her ashy grave). With the advent of the internet this documentary, which would otherwise have long been forgotten and consigned to the dustbin of time, has found its way on to YouTube. I came across two versions, the second one dubbed into Spanish, which looks to be a better quality copy. It is worth watching for no other reason, then seeing Nick B and Damian G (the latter wearing a fetching floppy hat, and bearing a very large pine cone and a stick) strolling across the Guildhall Yard being over-dubbed in Spanish.